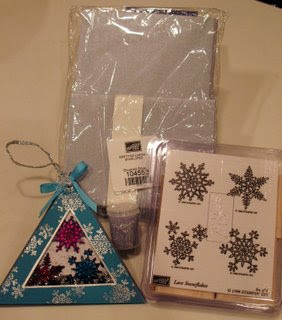 Today's offering is an unmounted, brand Lace Snowflakes stamp set, a retired set from Stampin' Up!. In addition to the stamps and ornament, you will also receive a pack of 15 silver cards with matching envelopes plus a jar of silver glitter. To enter the giveaway for today, simply leave a comment on Pat's blog entry telling her that you would like to enter by 11:59pm EST on Saturday, October 13. The Triangle Shaker ornament is an adaptation from the Triangle Shaker card in the December 2006 Technique Junkie Newsletter. The original instructions came from our friends at http://www.pennywisearts.com/.